← Pre-Sale Tickets: Are They Worth It? Before I close off this account of my travels, I feel it’s only fair to include some entirely gratiutous statements about the “highlights” of my month spent meandering around two big countries. People keep asking me questions about this sort of stuff, so … I’ll have a go at boiling down a whole month of my life into a few short “best of” moments. This is actually the thing that people ask me most about. “You’ve seen 12 concerts … which was the best one?” But, the reality is that every night is special in its own way, and there really isn’t any one performance that outshines all others in every regard. So … maybe it’s a cop-out, but I’d have to say that they were all the best 🙂 . To say anything else seems to somehow diminish the experience. Almost as unexpected were Leonard’s humorous remarks about Wellington’s “Colossal Squid”. Well, it’s hard to nominate just one … but certainly some of the LC solo performances of Avalanche and A Singer Must Die were quite stunning moments during the concerts. Also, being a bit of a lyrics-spotter, the variant version of the poem A Thousand Kisses Deep offered up by Leonard in Perth also stands as a memorable performance. A tie between: (1) the moment during her first performance (Brisbane) where Clare Bowditch realised to her extreme and genuine surprise that she was being shown up on the big screens … and (2) Linda Bull’s performance of Everything’s Turning To White at Hanging Rock. Actually, to be honest there were a lot of other great Clare Bowditch moments too — I just wish she’d played my favourite of her songs (You Looked So Good) more than once during the tour. 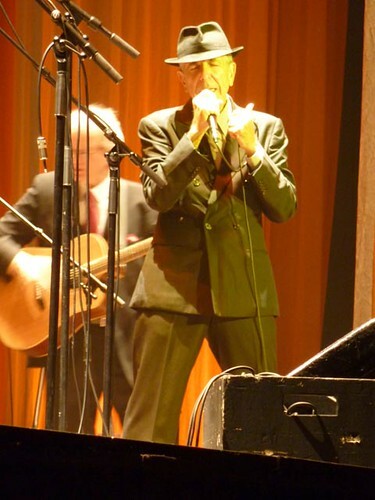 Rod Laver Arena … it was the only big and boxy room that Leonard played which didn’t *sound* like a big and boxy room. 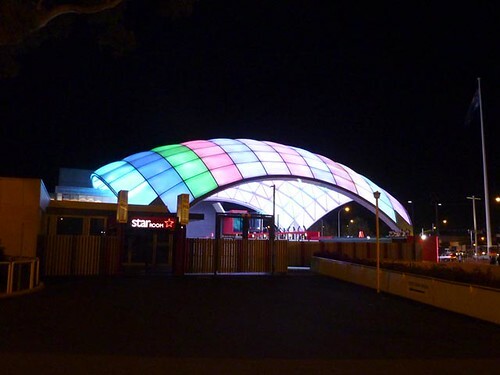 Adelaide Entertainment Centre … well at least from the outside it looks nice and new. Bev’s soft-toy kangaroo, Matilda, lobbed up on stage at Brisbane only to be picked up by Leonard and gently placed on Rafael’s drum platform behind him. 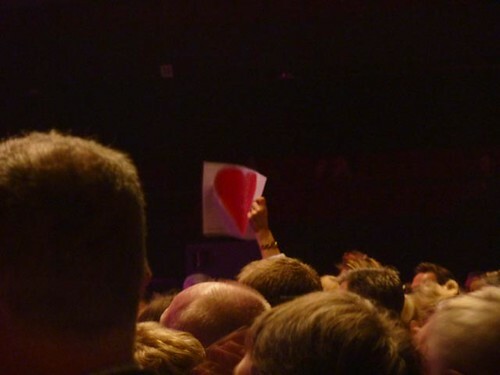 Helena’s laminated A4 Heart banner, which she brought to both the Adelaide and Hanging Rock concerts. 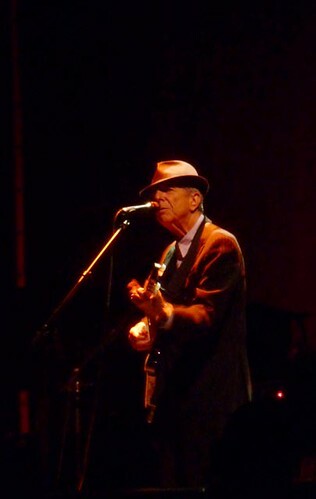 Helena was such a trooper … she literally waved this banner above her head at the end of every song Leonard played. Federal Coffee Palace, Melbourne GPO. I initially stopped there to meet some old friends for coffee … but that quickly became two coffees, and then … well a whole afternoon’s worth of coffees. Midnight Espresso, Wellington (Cuba Street). If I lived in Wellington, New Zealand *this* would be one of my regular haunts. It’s kind of like a cross between a funky cafe and a bohemian bar. And most of the food is vegetarian … what’s not to love? The $5 mug of black coffee I bought at a cafe in Australia Square, Sydney wins this award. Although (surprisingly) this was closely followed by expensive coffee at a cafe in Salamanca Square, Hobart. Fountainside Hotel, Hobart. I have already sung the praises of this hotel in the blog writeup for Hobart … but it really was a great place to stay, and excellent value for money (something I was certainly appreciating by that part of the trip :-)). Be warned, however, that staying in a hotel with cheap and tasty buffet breakfasts can lead to chronic over-eating. I’m just saying.